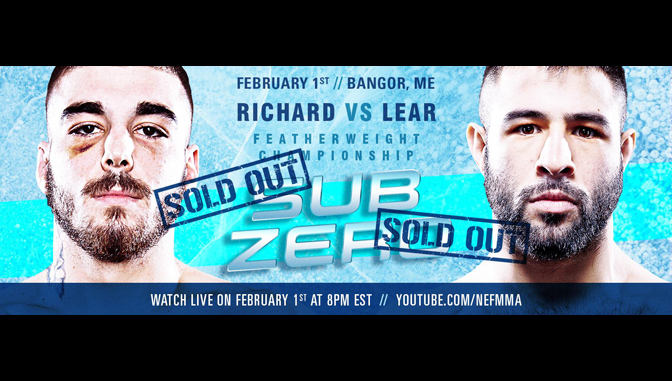 FOR IMMEDIATE RELEASE: Bangor, Maine (January 31, 2019) – New England Fights (NEF) will hold its next mixed-martial-arts event, “NEF 37: Sub Zero,” this Friday, February 1, 2019 at the Cross Insurance Center in Bangor, Maine. Earlier today, the fight promotion held the event weigh-ins at the Sea Dog Brewing Company in Bangor. Two featherweight title fights will be featured on the card. Both fights are scheduled for five rounds. Bill Jones (13-10) and Josh Harvey (5-0-1) both made the 145-pound limit for the NEF MMA Professional Featherweight Title bout that will headline the card tomorrow night. Likewise, both Fred Lear (6-2) and Zac Richard (3-0) were on weight for their clash to crown a new NEF MMA Amateur Featherweight Champion. NEF’s next mixed-martial-arts event, “NEF 37: SUB ZERO,” will take place this Friday, February 1, 2019 at Cross Insurance Center in Bangor, Maine with a bell time of 8 pm. Tickets are sold out, but the event can be viewed live via stream at www.Youtube.com/NEFMMA.